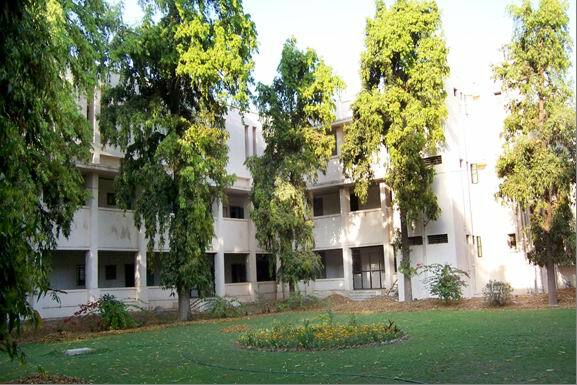 Gujarat University, Navarangpura, Ahmedabad – 380009. [ * All three Professors have received a " Certificate of Honour "given by the President of India for their researches in the field of Sanskrit Studies. 2. Vyakaran , 3. Alankar , 4. Sankhya - Yoga and 5. Purana Shastra.This is a special and a unique feature of the department among the universities of the Gujarat State. The department has been running M.Phil. programme since 1981. During these four decades, i.e. the period of 1964 - 2004 , the department has provided research guidance to the Ph.D. students. As a result of this activity about 75 candidats have got Ph.D. degrees from the department. Each of the faculty had, besides teaching , numerous publications to their credit. 1. 32nd session of the ALL INDIA ORIENTAL CONFERENCE ,( 6 - 8 Nov. 1985 ) was organised by the department on the university campus. 2. International seminar on Acharya Hemachandracharya's literature (19 - 20 January 1989 ) was organised by Prof. T.S. Nandi in the Assembly Hall of the School. 3. Traditional Vedic Sammelan ( under auspices supervision of the Rashtriya Veda Vidya Pratisthan ,Ujjain) was co-ordinated by Dr. V.M.Bhatt & Dr.K.C.Chokshi , at the Veda - Mandir,Ahmedabad. on 8-10 January 1998. 4. Seminar on PANINI'S GRAMMAR was organised (18-19 January 1996 ) at the School. 5. The department has co-ordinated eight different Refresher Courses in Sanskrit for the lecturers of affiliated colleges. 6. The Canadian World Education Foundation, CANADA, has awarded the " RAMAKRISHNA SANSKRIT AWARD - 2001 to Prof. V.M. Bhatt in recognition of his distinguished and outstanding contribution to Sanskrit Research and Teaching , in India. 3 Lecturers. But one post of a Reader and one post of a Lecturer is vacant.Thereare four faculty members in the department at present. Ten students reading for the Ph.D. degree under the guidance of Prof. V. M. Bhatt & Dr. K. C. Choksi. Students are very much interested in offering the classical language like Sanskrit as their special subject. Every year there are 200-250 applicants for new admi8ssion in M.A. course. Good numbers of students are getting jobs in high schools and in under graduates colleges. Sanskrit is being taught as a compulsory subject in most of the Universities of the Gujarat state. The department of Sanskrit is an intergal part of the "University School of Languages" (USLg). It has no separate building. We have a common clerical staff and a Director, who looks after all the necessary teaching aids. The Department of Sanskrit has concentrated on some remarkable objectives; e.g. · The language teaching through grammar. · Teaching of various "Shastrs", e.g. 1) Vyakaran (Grammar), 2) Alankar (Poetics), & 3) Dharma & Puran shastra. facility of learning a world renowned grammar, viz. PANINI'S ASHTADHYAYI). · Appreciation of Classical Sanskrit Literature and good acquaintance with Vedic Grammar and studies. · Teaching of Kautilya Arthshastra & some Rock Inscription. · Research work in general, and critical text editing of unpublished Sanskrit manuscripts in particular. (Department has collected more than 300 copies of rare manuscripts for higher research works. In the neighbouring area of the university, there is an institution namely the "L.D.Institute of Indology" where 75000 manuscripts are preserved). · We have also designed our syllabus to meet with the requirement of NET/GSLET exams. (4 students of this department have cleared NET exams & 8 students have cleared GSLET exams). NAME OF THE COURSE : M.A. from any recognised university . Pali- Prakrit, Urdu-Persion, English & Linguistics. Entire Sanskrit (Four Papers ). (c) Dharma & Purana Shastra. but admission process begins after the B.A. (2) Reservation quota will be maintained as per the government rules. There are two terms in each academic year. S.C./ S.T./ SEBC Students . COURES OFFERED AT : The University School of languages Building. OPPORTUNITY degree of B.Ed. necessary. (b) Student with 55% marks at the M.A. exam can be a lecturer at any under – graduate college (but he / she is supposed to pass the Net / Slet Exam). (c) Clerical job in any Government / Non –Govt. organization after GPSC & UPSC Exam. NAME OF THE COURSE : M.PHIL. COURSE TYPE : Grant in Aid . INTAKE : 12 Student . Sanskrit as a main / entire subject . subject, within one and haff year. SPECIALIZATION : Student may select any one ‘Shastra’ as his / her special shastra out of two 1) ‘Sanskrit Grammar’ or 2) ‘Darshana Shastra’ .There will be one paper for this shastra specilization out of three Complasory Papers mantioned above. One and half year for dissertation (at home). ADMISSION PROCESS : By Merit only . COURSE OFFERED AT : The University School of Languages building which is also known as “Bhasha – Sahitya Bhavan”. Qualification : M.A., DIL, Ph.D.
Qualification : M.A., PGDIP, Ph.D.
Qualification : M.A. (Grammar), M.A. (Vedant), DIL, Ph.D.